Thank you for coming to Rueda Square yesterday. 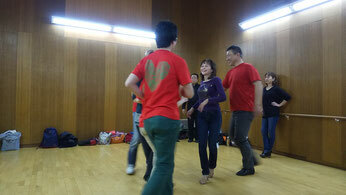 At first, we went through the all flash mob routines and we found lot of errors. The biggest issue was movements don't match call/signal, so we tried improving our image. Finally, our performing was gradually getting better. Everyone helped each other to be able to get our moves together. It was very helpful. Next time is our final rehearsal. We should be able to organise everything till 3 p.m. if it is not, we will practice at Susaki park after this. I'm going to shoot videos to be able to practice yourselves until 30th. * The next Rueda SQ will take place on Sunday, the 24th of March at 12:30 p.m. We will do the same routine for both the flash mob on March 30th and the festival on April 20th. We will practice for the Rueda flash mob in advance. We are looking forward to seeing you:).